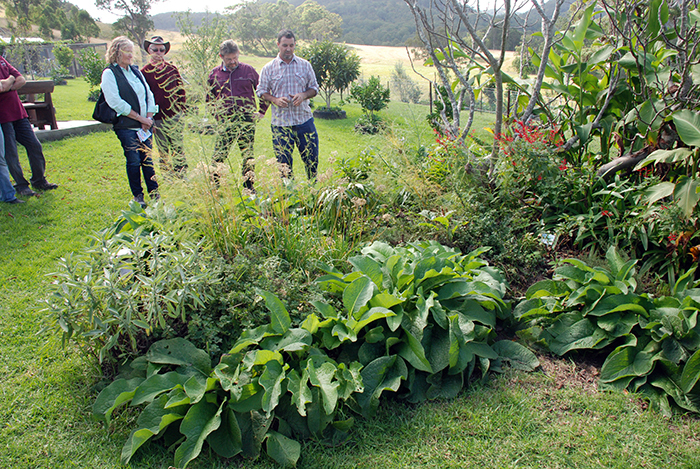 Swales, comfrey, and food forests have become synonymous with Permaculture. 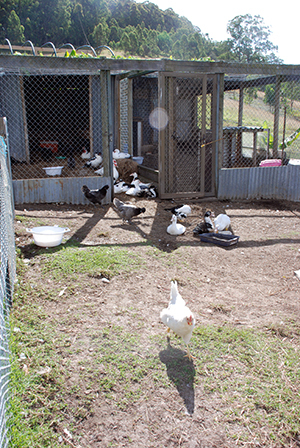 In Stroud, a quaint little town of wooden cottages in the Hunter Valley, I visited a flourishing small farm that included all this and some wonderful creative ideas in the spirit of sustainable living. 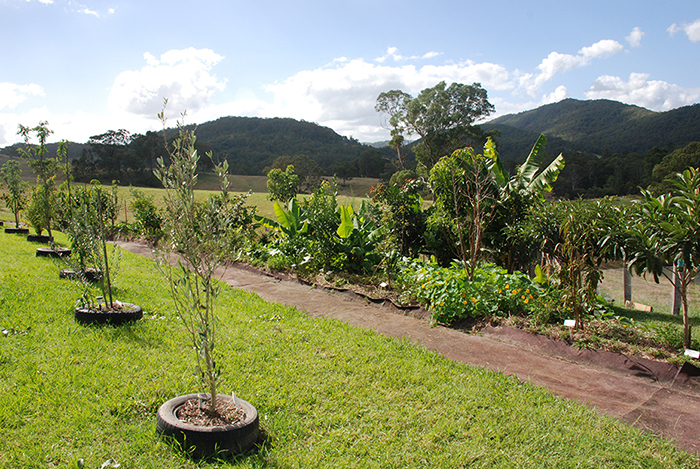 It was World Permaculture Day and Brett Cooper had opened his one acre property to showcase how a small plot of land can sustain his family and provide produce for the local community. 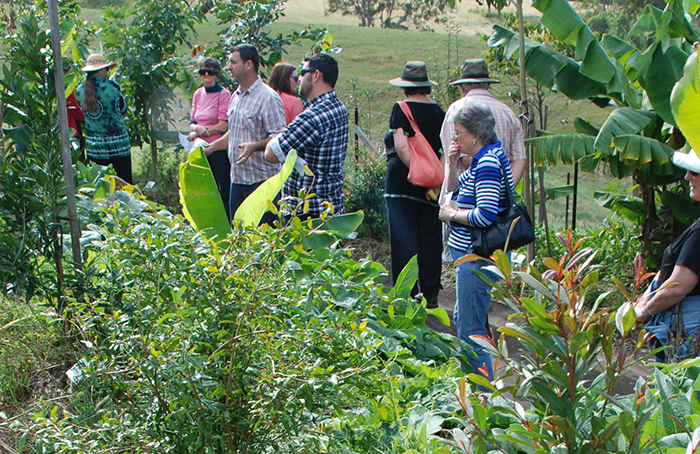 Brett at home in the food forest explaining his planting method of using 'nurse' plants. 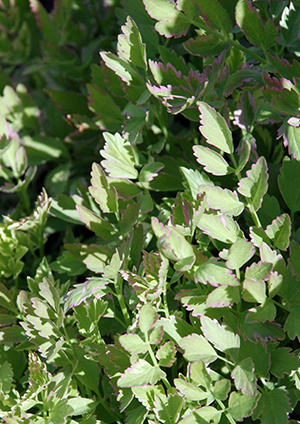 Nurse plants are selected that benefit the growth and production of other plants and are planted closely with their 'host'. 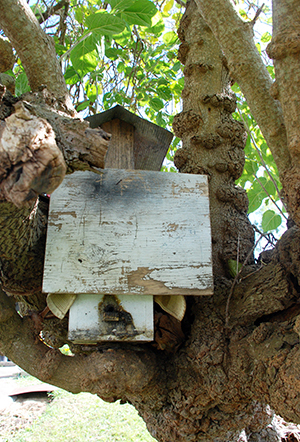 They can be removed as the host reaches full size to minimize crowding. 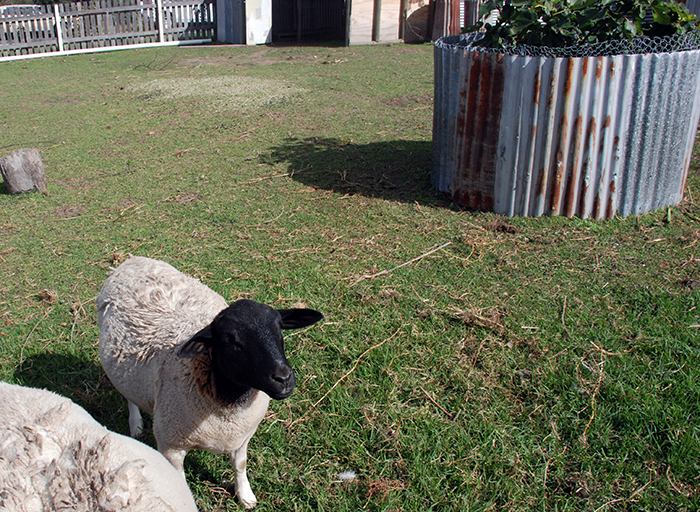 Dorper sheep are a self shedding variety well suited to Australian conditions. Brett keeps a small flock of three. Lambs that are produced will be processed on site by a mobile abattoir. In their paddock are a number of fruit trees protected by iron that withstands the sheeps eager attempts to eat the foliage. Under the trees are beds of sweet potatoe. A fantastic pyramid of Celyon Spinach in flower. colouring for icing. Seeds are available from Eden Seeds. matting is used to on the paths. 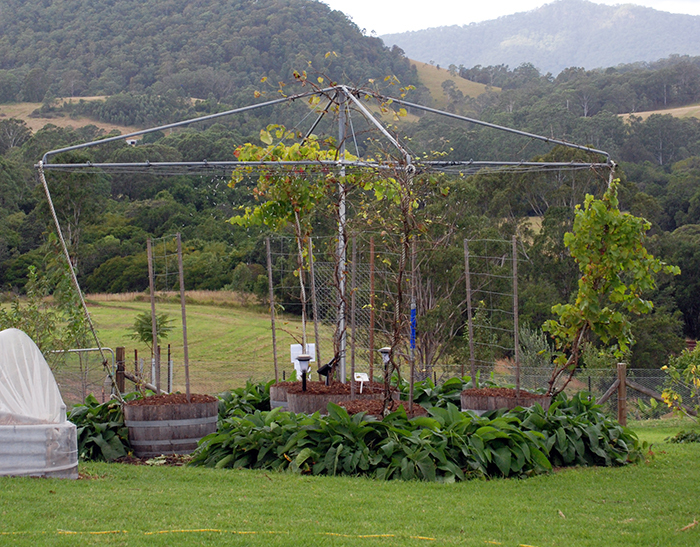 The good old hills hoist put to a use as a trellis for a grape vine. 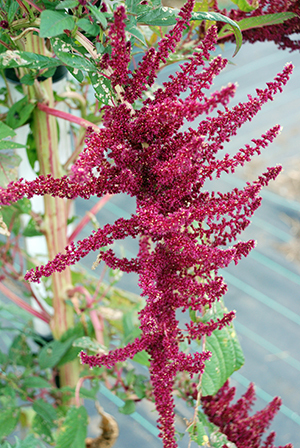 Gorgeous flowers of pink amaranth. and eat the tiny seeds as a gluten free grain. Brett is building a market garden. 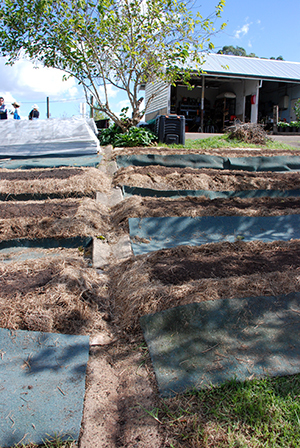 lawn with compost and mulch on top. The paths are laid with wool carpet. water as it runs down the slope. 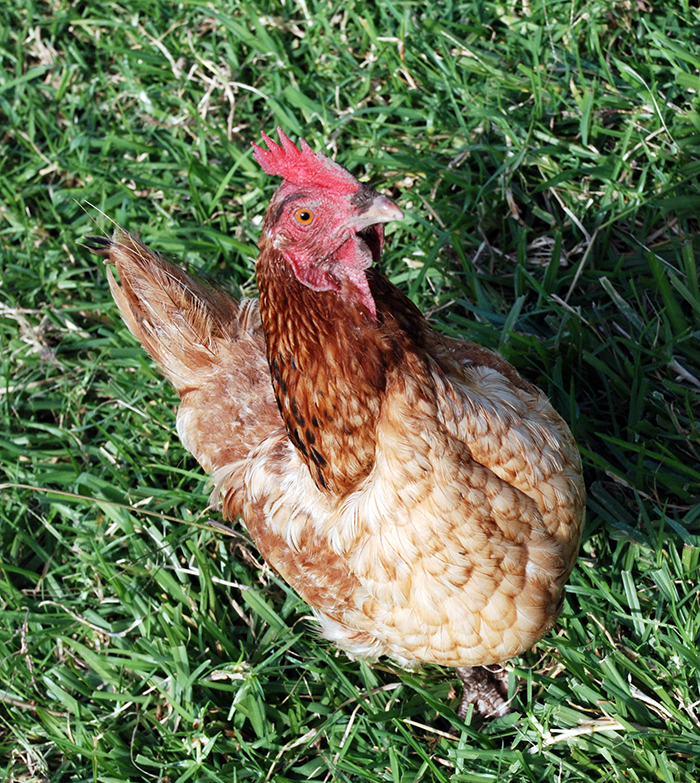 What is permaculture without poultry? their own paddock and house. 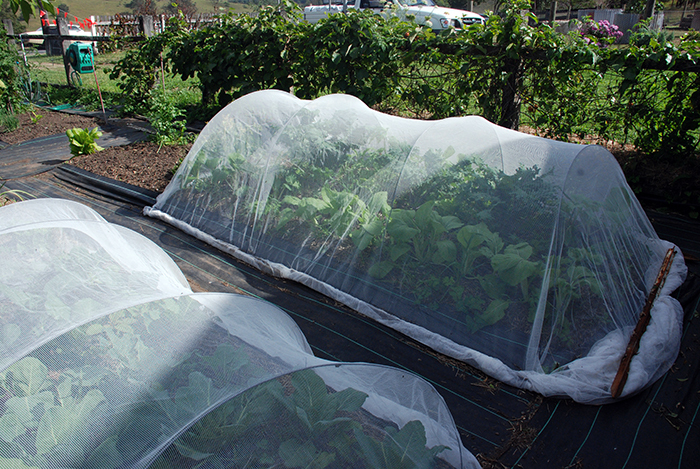 A simple method of keeping white cabbage moths at bay. Loops of wire provide a frame for fly netting. 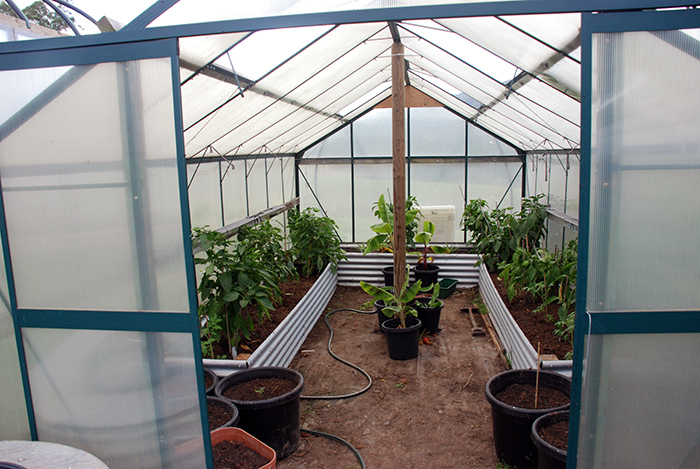 The green house offers perfect conditions for a winter crop of tomatoes and capsicum. 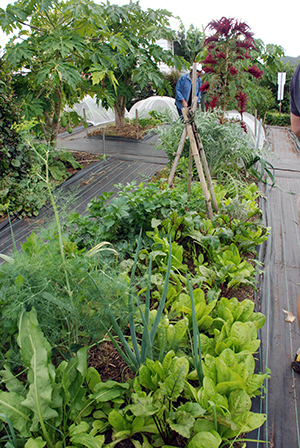 The raised beds and overhead wtering system are a great design feature. and more form a nice little ecosystem. 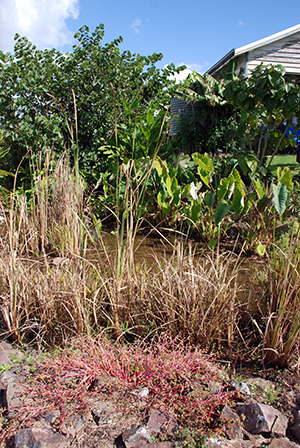 Permaculture design aims to mimic natural plant communities by grouping species that will benefit each other and that like similar conditions. 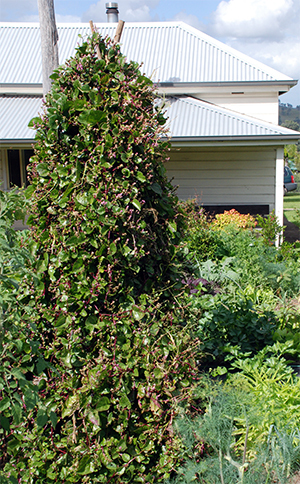 Brett has grouped a herb garden on the upper slope of this garden with a comfrey border to prevent the grass invading. 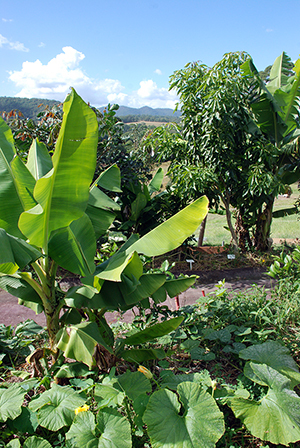 On the lower slope are plants that love moisture, such as bananas, arrowroot, tumeric, and galangal. The back corner of the block slopes steeply. Swales catch the water and wool carpet (selected for it's low toxin levels) is employed to mulch the paths. 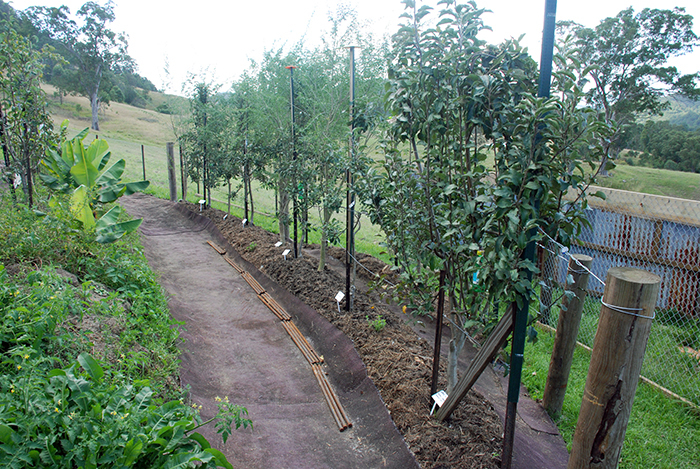 Tyres provide a temporary border to the grass around some of the trees. Brett advises against growing root crops or vegetables in tyres as they leach chemicals into the soil which is absorbed by such plants. 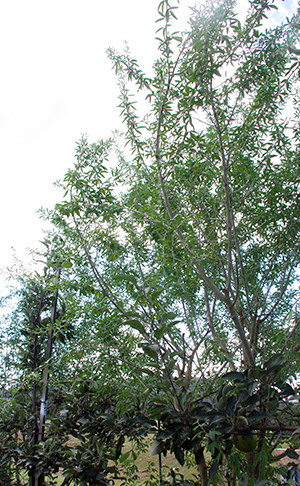 However fruit trees aren't affected. to allow more room for the main crops. valuauble source of vertical browse. so it is best purchased in tree tubes.